Cut electricity costs and find out what appliances are actually worth keeping plugged in by simply connecting appliances to the Kill A WattEZ and assessing how efficient they really are. Just plug the monitor into a wall socket and then plug the appliance into the monitor. 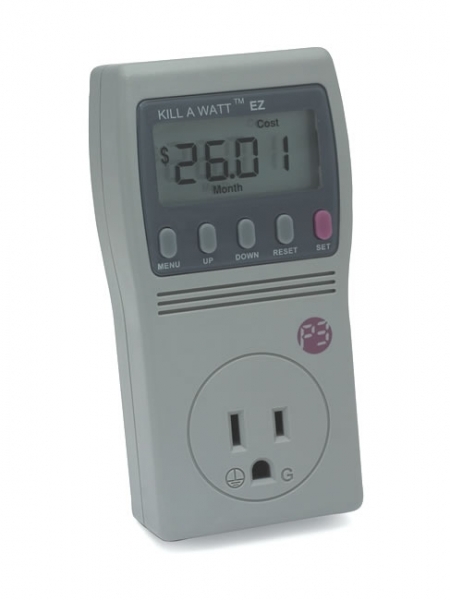 A large LCD display counts consumption by the kilowatt hour (kWh), while the battery backup and built-in memory retaining the accumulated readings if the power is interrupted. Program in your local electric rate and calculate electrical expenses by the day, week, month, even an entire year - it's accurate to within 0.2%. Displays 8 critical units of measure, including voltage (V), line frequency (Hz), and power factor (VA). Quickly and easily know if it's time for a new refrigerator or if that old air conditioner is costing you a bundle. With the amazing Kill A WattEZ you´ll know “watts” killing you. Perfect for detecting voltage drops and brownout conditions before they damage delicate equipment.